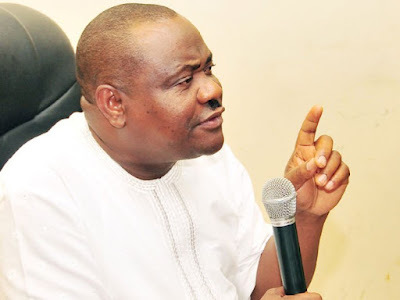 THE Rivers State Governor, Chief Nyesom Wike, has described as false an online report that he bribed some Supreme Court justices to get his governorship election victory validated. Wike said his election was upheld in line with the same principles of law that also validated the election of some governors who contested on the platform of the All Progressives Congress. The governor, who spoke through his Special Assistant on Electronic Media, Mr. Simeon Nwakaudu, was reacting to an online report that some Supreme Court justices were begged to accept N5bn bribe to validate his election. But a statement signed by Nwakaudu, read, “For the avoidance of doubt, Governor Wike did not bribe any Supreme Court justice or justices to get his election validated. The governor has always had confidence in the judiciary to uphold the tenets of the law. The governor, however, accused the APC in the state of being behind the publication that tended to cast aspersions on his election victory. But the state APC disagreed with the position of the governor, saying it had no direct or indirect link with the online medium that alleged that Wike bribed judges to get his election validated by the Supreme Court. A statement issued in Port Harcourt on Thursday and signed by the state Publicity Secretary of the APC, Mr. Chris Finebone, read, “Records abound to prove that Amaechi and Peterside have, at one time or the other, came under intense scrutiny in the reports of Saharareporters. “It begs the question when Governor Nyesom Wike says that the two very busy respectable individuals can spare the time to think about the governor and how to sponsor Saharareporters to scrutinise him, his infamous reputation and derelict government. “It is perhaps appropriate and well-timed that the press release by Governor Wike has something to say about whether or not he bribed any justice of the Supreme Court over the 2015 governorship matter.